The red carpet (literally) thanks to our friend, the Marchese Rosselli del Turco. Our suite, a living room, formal dining room, large bedroom and 2 baths. Quite a contrast to our modest Roman flat! Best part: Breakfast served in our suite. 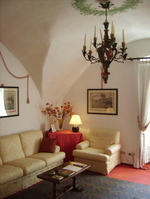 The club offers two suites for traveling members. In the afternoons, a thousand bells ring in the churches below. The Rosselli exhibition in Italy continues to move forward; growing excitement over here.